Every year is different. Gardeners can't possibly know for certain how our gardens will fare by summers' end. Will they melt away with the heat or will they stand the test to flourish in spite of harsh circumstances? The elements out of our control in the midst of summer can make all the difference. Rain or the lack of it, the heat index, humidity levels, storms, and weather patterns. 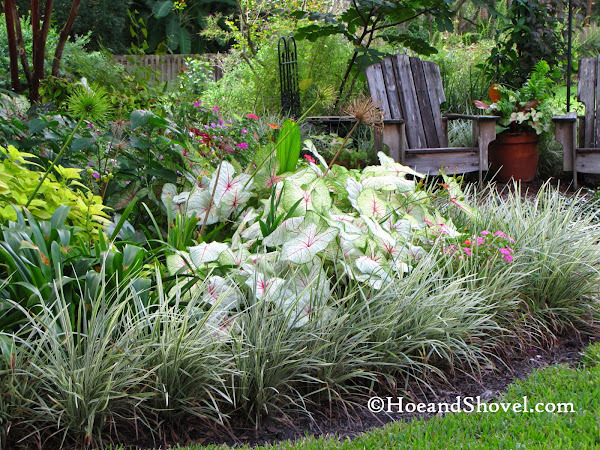 All factors lending credence to the stress levels of a Florida garden. Perhaps this is true, more or less, no matter where you garden. 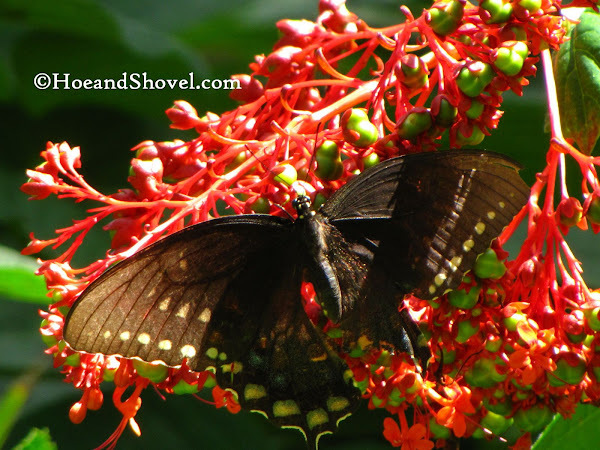 Having only gardened in Florida all my life it is Florida summer I'm very familiar with and more and more in-tune each year to how it affects plant-life. 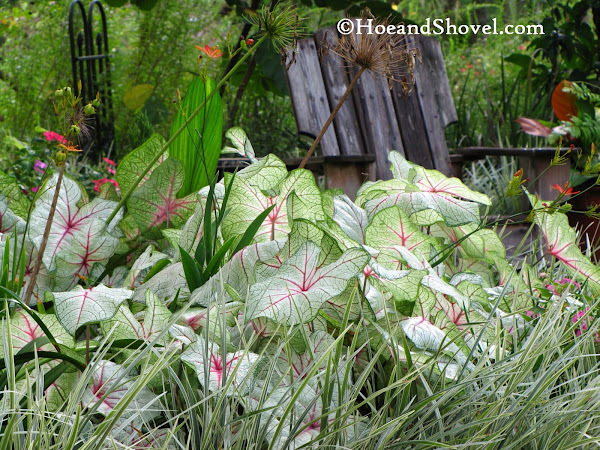 Planting Caladium x hortulanum bulbs in spring and/or summer has the potential to deliver loads of lasting pizzazz to the late summer garden. It has been discovered here that no matter what those overly-heated months of July and August have in store for us, the caladiums are shining stars well into September... and if planted a little later will stay perky as long as October and November. It is no secret I'm a huge fan of the ease of maintenance and the colorful zing they possess shamelessly tucked into just about every border somewhere or the other. 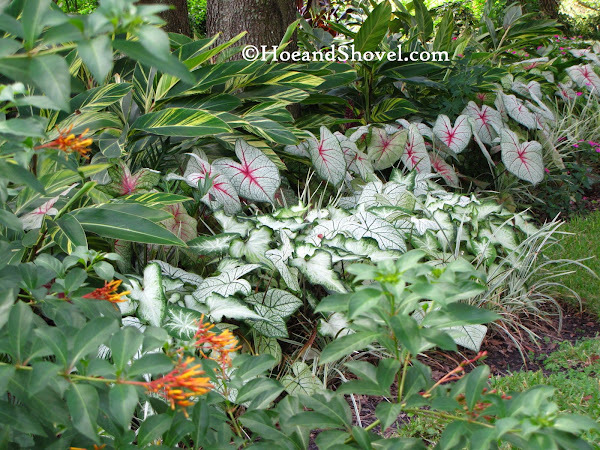 Fortunately for Floridians, the conditions caladiums prefer are just what we have to offer. Soil temperatures of at least 75-78 degrees and high, relative humidity of 90% is what they ask for to perform well. Choosing the appropriate variety of bulb is key to the overall outcome to be enjoyed in the landscape design. There are so many to pick from and they range in color, height, and sensitivity to sunlight. All those heart-shaped leaves poking their pretty foliage out in between other plants is what makes them stand out. Naturally, I'm a little biased. But don't they just look good in any setting! But forced into narrow spaces in great numbers is what we prefer for their sassy way of being noticed among all the other textures and forms welcoming them as summer-long residents. I love all your caladiums. I have tried many times to grow them in my climate 4 to 5 but haven't had much success. They are annuals here ,but I have seen them in locals garden and they looked great, so I will keep trying. The abundance you have makes them even more beautiful. I won't break your heart because I also love caladiums. I put them in my window box every summer. They are the best at bringing color to that little spot. They even bloom for me there occasionally. It is raining here this morning. YAY!!! Our first drop of water this month and it is actually several drops. Almost an inch is predicted. I hope we get every drop available. I love seeing all of your caladiums. You have so many of them and such a wonderful variety. Every time I see your lovely gardens I get inspired, so keep working in mine. I have one little caladium and it has passed for the year already. I'm no doubt not doing something right. Seeing all of yours is always a treat. Don't stop taking and sharing your pictures of them. You don't hear any complaints from me. They are gorgeous. 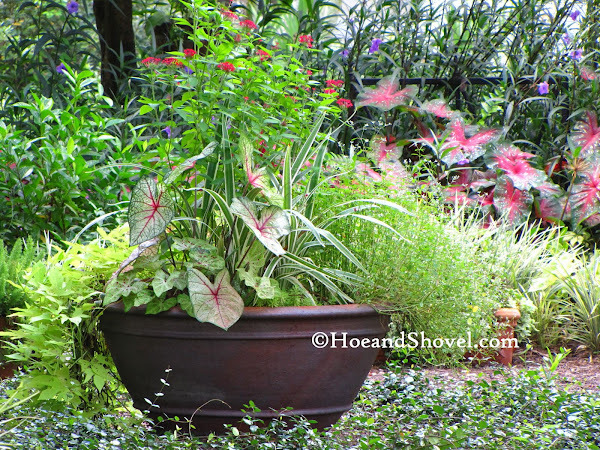 I returned from my week's travels last night, and I was so happy to see (only gardeners notice how the plants have grown when they pull into their dark driveways after being gone for a week) that my caladiums and coleus around front had sprung up even more. The grasses I planted to mask those ugly TECO boxes are doing their job and were lazily bending with the breeze. 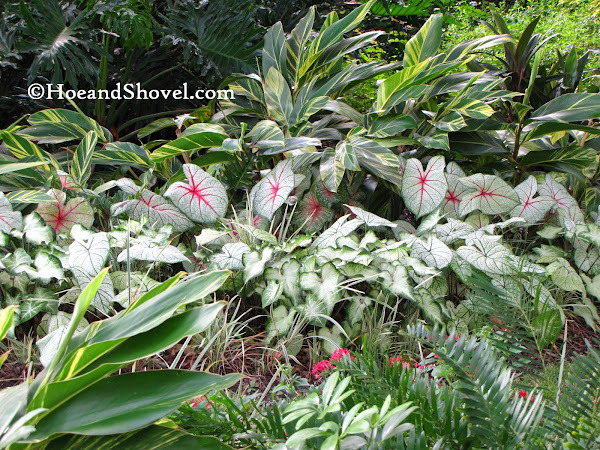 Yet, the caladiums were the eye-catchers. All colors and shapes. Beautiful. Oh, and my candlestick plant (tree?-Cassia?) had lost all of its leaves and I was so sad. I set it out as a stick anyway, and thought "well, let's see what happens". Much to my surprise, it has new leaves! So, though I shouldn't say so, thank you. My little herb garden will have a new shade from the hot sun next summer. 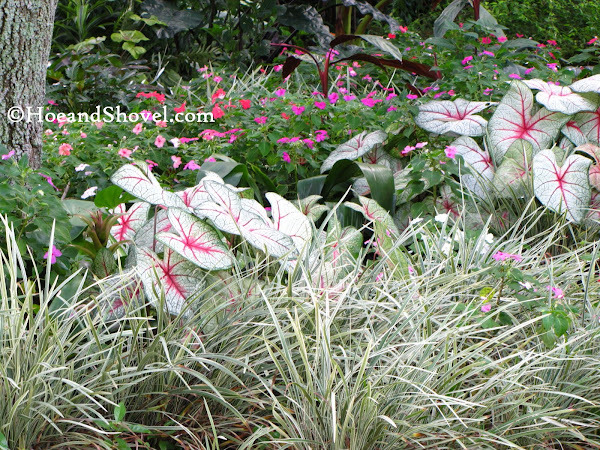 I have seen caladiums in lots of gardens in the northern zones. Typically in containers and they look wonderful. I'm not certain as to how they last but they make a wonderful addition to any arrangement. Welcome and thanks for your kind comment. I LOVE your window box! And hurray for the RAIN... here's hoping you get all they predict and more. Not doing anything wrong probably. Some of them DO fade by now. That's why I plant mine in succession of sorts. It makes them last longer. I always check my garden before I even walk in the house when I've been away. 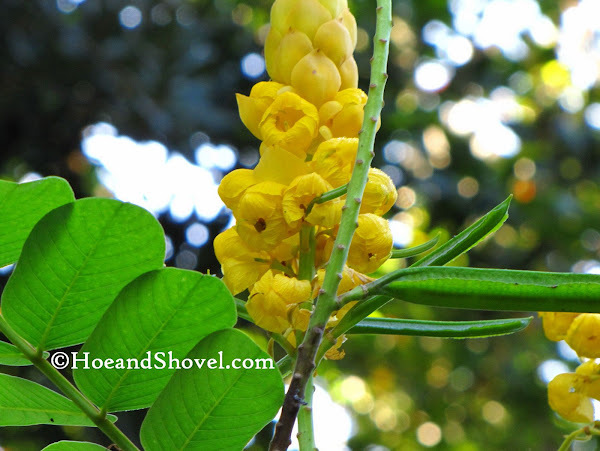 I'm wondering if a cloudless sulphur cat might have eaten the leaves on your cassia?? They are ravenous little instars. 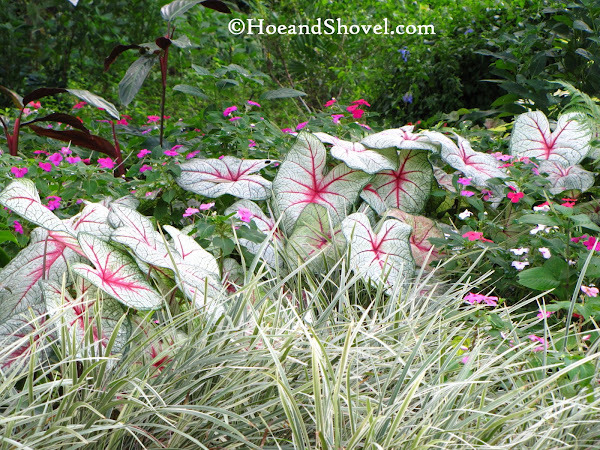 Welcome home glad all is going well with your caladiums and grasses! It's been a long, hot summer in SW Florida. I am south of you in Sarasota. Everything is lush and green. I definitely plan to add more caladiums next year. I ♥ them. Next spring I will again buy one package of bright orange cosmos. My beds are full of them. Now they range in color from yellow to bright orange. Take a pic in the early morning before it is completely and the bright orange really pops out....looks like a stop light. Indeed you should continue to sing caladium praises, Meems, they are stunning and provide a great show in your lovely garden. They do well in containers for me in summer then bring them inside to cheer me throughout winter. Hi Meems. Your Caladiums are always just so pretty. I love them planted in waves along your garden bed. Makes such a lovely bed and brightens up the space. I will add to the praises, your caladiums are stunning. I'm making a mental note to add more to our planting areas next spring! 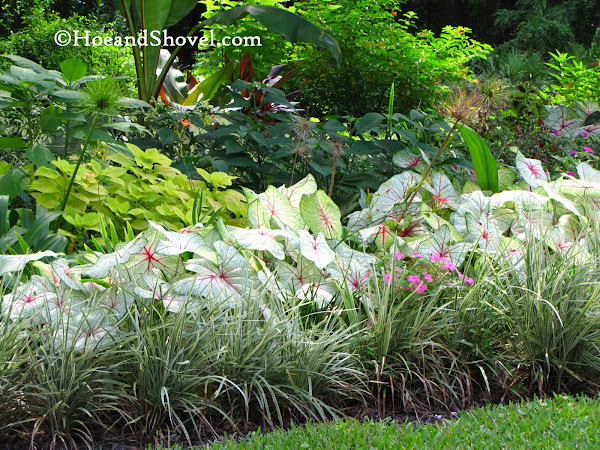 I bought over 75 caladium bulbs for my St. Pete garden and now we are moving to NC. I am glad I never put them in the ground as it was early summer and I decided to wait until next spring. I will have loads for pots now up there. I would love to put them in the ground there also, but I am assuming they would be an annual up there and have to be dug up at summer's end. Yours are beautiful and it is you that inspired me to branch out and try bulbs I have never planted in my garden before. Here --we've had one of the hottest and driest summers I can remember... Our roses have made it--but thanks be for George and his watering and babying them... They like sunshine --but not so much heat and dry weather. you and your caladiums...gotta love them. they make such a wonderful statement in your garden. you have chosen so many amazing varieties. i love seeing them in their full glory. your colour choices are perfect. 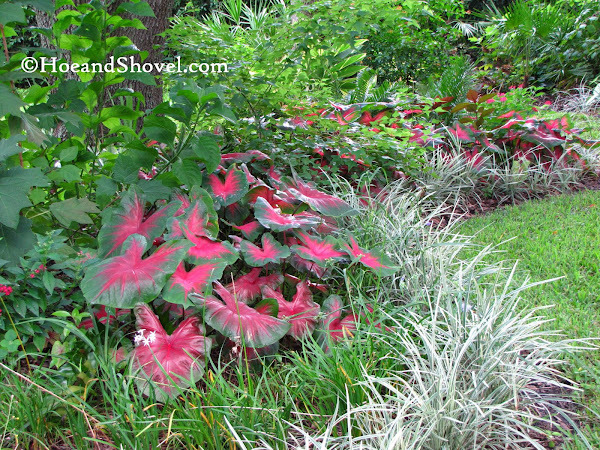 Yes, I do think that caladiums are your signature plant! I especially love the reds, and I love the way you have them planted in rows. I too love, love, love these cheerful hearts. They are some of the first things I threw into my garden when I bought my first house two decades ago. They really give a lot of bang for the buck. Right now, my caladiums are starting to fade. O_O Guess they're feeling the cooling of the earth. It is the very saddest thing about fall to me. They constantly try to come back all winter. I see colorful little hearts peeping out from time to time. Fortunately, the camellias are in bud again, so the spirits will not be down for long. I'll never get tired of caladiums. It makes me sad that the garden centers don't stock the bulbs so much anymore. "Back in the day" the selection was huge! Nowadays, I mail-order them, usually. 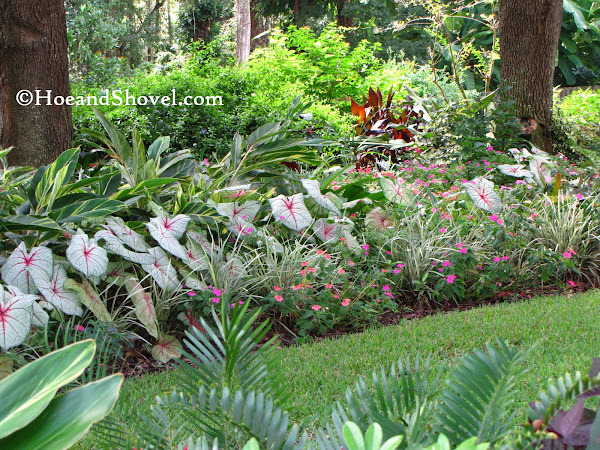 Those pinks and greens of the caladiums are glorious, Meems! No wonder you love them so much. They're perfect for your garden. Gotta love a plant that gives so much for so long! I've never tried growing one. Can you believe it? I'd love to though. Probably in a container, as Joey mentions, would be a good way to go in my NY garden. 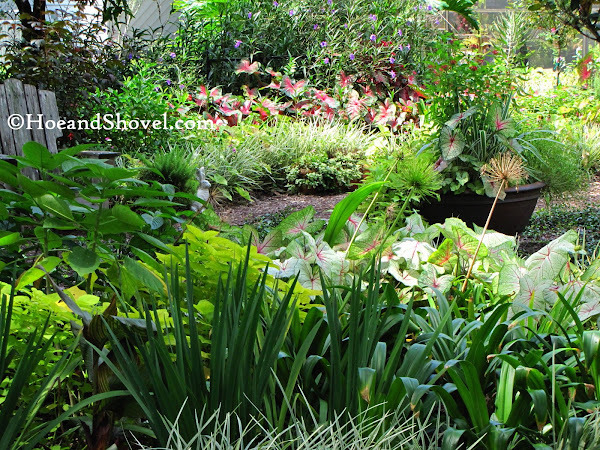 I am a first timer to your blog and I am impressed with your garden pictures. Makes my mouth water to see such beautiful flowers. I live south of you but, in a cool area and have a difficult time with getting the right plants to grow and flower. I would love to be able to see your beautiful garden. Your caladiums are beautiful and inspiring.